When Ashley Sullivan, assistant professor of early childhood education at Penn State Behrend, suggested that students in two of her spring 2016 classes plan a community service project, one idea was top of mind for Karlie Aschenbrenner. Aschenbrenner, a sophomore Elementary and Early Childhood Education major from Pittsburgh, thought of the concept behind Brady’s Blankets, a program of the Fairfield, CT, children’s non-profit Brady’s Smile, which provides homemade fleece blankets to babies and children in the Neonatal Intensive Care Unit and Pediatric Intensive Care Unit. The students voted on the service project ideas, and Aschenbrenner’s suggestion was the clear winner. Every student in both Sullivan’s Instruction in Early Childhood Education Derived from Development Theories and Competing Rights: Issues in American Education courses donated $5 each to participate in the project. 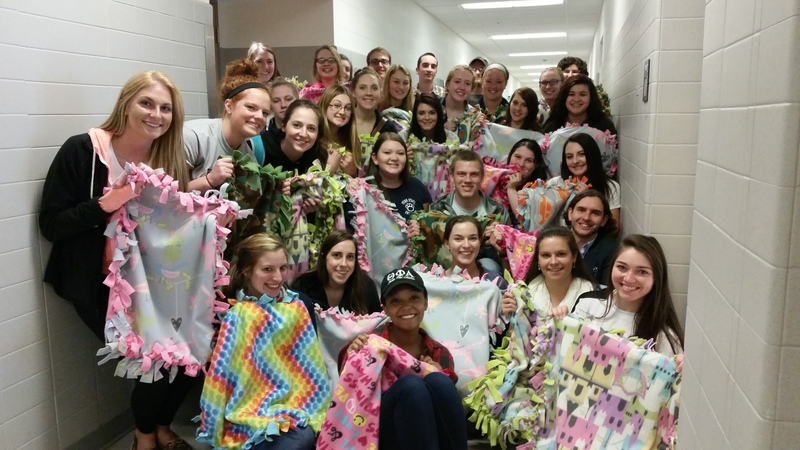 They spent their last day of class cutting and tying to create 75 blankets, which were donated to Brady’s Smile and then sent to University of Pittsburgh Medical Center’s Children’s Hospital of Pittsburgh. Aschenbrenner was not the only student with whom the cause resonated. “The children that we’re donating these blankets to could eventually become the kids that we’re going to teach, so just giving them a better chance to thrive and survive can mean a lot,” said Madison McFeely, a first-year Elementary and Early Childhood Education major from North East. In addition to creating the blankets, Sullivan’s students volunteered at the Second Harvest Food Bank of Northwest Pennsylvania where they packed more than 200 food boxes to distribute to local seniors. This entry was posted in Around campus, Community Service, School of Humanities and Social Sciences, Student News, Student projects and tagged Behrend, Brady's Blankets, Brady's Smile, Elementary and Early Childhood Education, Penn State Erie, Second Harvest Food Bank of Northwest Pennsylvania. Bookmark the permalink.